Breaking into a triple-digit aperture this mid-range model in the series, the StarPro 102mm f/6.5 Achro AZ Refractor Telescope from Meade extends its reach so astronomers new to the hobby can enjoy detailed views of the moon's surface, see the rings of Saturn, the Martian polar ice caps, the striped bands of Jupiter, plus bright deep sky objects like binary stars, globular clusters, and galaxies. 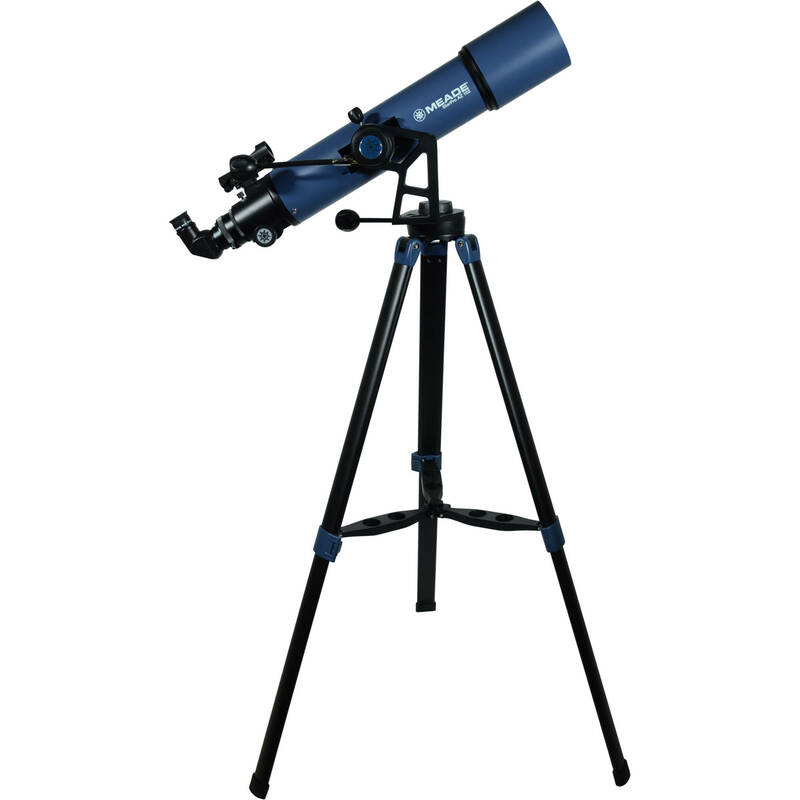 Meade also includes a variety of accessories that can allow you to use the StarPro as a conventional spotting scope to view Earthbound subjects as well. Its manual alt-azimuth mount has slow-motion controls for precise positioning and tracking, with a sturdy aluminum tripod that can be used by a wide variety of users—from tall to small. Three eyepieces provide 25x, 73x, and 105x magnifications with a 2x Barlow lens that doubles the magnification of each eyepiece for a wider range of observing possibilities. A 90° diagonal not only places your head in a comfortable viewing position, but its integrated erecting prism corrects the view for terrestrial use. Meade also includes a smartphone adapter that allows you to capture photos and video through the eyepiece to enjoy, share, and like. With its short optical tube the StarPro is extremely portable and at just under 11 pounds the entire telescope rig is easy to handle by astronomers of all ages. Box Dimensions (LxWxH) 35.0 x 18.0 x 9.0"